Click on the Download Now button or link below and learn why crochet baby patterns are so satisfying! Who can resist those tiny garments and crocheted accessories? Moms always appreciate handmade gifts, tailored specifically for their newest addition, and these little projects provide opportunities to experiment with a new stitch or construction technique. Plus these quick and easy items make great stash busters-or perhaps a chance to indulge baby in a bit of luxury yarn! If you have been looking for a new baby crochet pattern, you’re sure to find just the right crochet solution by clicking here for the Free Crochet Baby Patterns eBook. With genius solutions and instructions for how to crochet a baby blanket, and patterns for lovable crocheted baby hats, a crochet baby cardigan, and other garments, Crochet Me has you covered for all your baby crochet pattern needs. 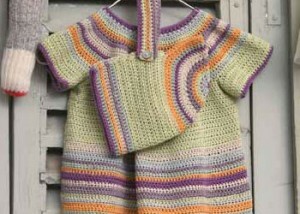 Every new baby needs a warm crochet afghan, so included is the Magic Carpet Blanket. And you will also find two great new hats. We hope you find the perfect crochet gift for the babies in your life. The Magic Carpet Blanket by Melisa Darnieder will be a favorite of both mom and baby. 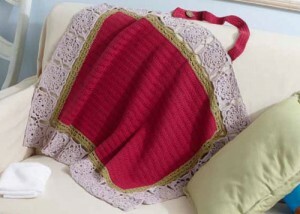 A crochet interpretation of the Around the World pattern, front post and back post double crochet stitches mimic handstitching in this warm wool baby blanket. The thick, warm blanket works equally well as a blanket or play mat for little ones of all ages. Washable yarn makes this one easy to maintain and clean up. Molly’s Mukluks by Toni Rexroat are designed to keep the wee one’s feet warm in style. The tall shaft of the boot ensures these fashion-forward booties will stay on while the buttons make them easy to put on and take off. 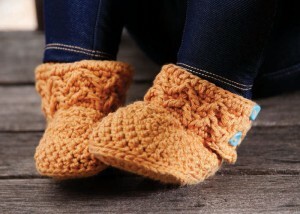 Crochet baby booties are really the perfect accessories for baby’s wardrobe. Inspired by her namesake niece, the Kathryn in Beauly Dress and Hat by Kathy Merrick will transport you to the Highlands of Beauly, Scotland. 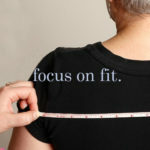 The top-down construction, beginning with the striped yoke, minimizes seaming. 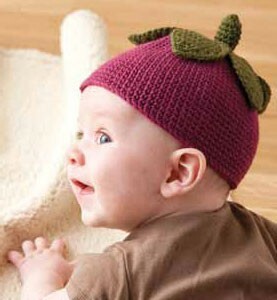 And the matching bonnet can be worn with the striped edge flat or folded back. This crochet baby dress and matching hat are adorable when worn together or separately. 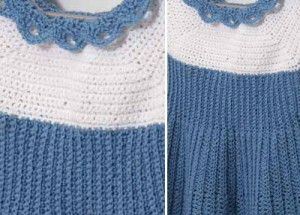 Combine these two patterns for a beautiful matching spring set for a toddler or baby. the three-dimensional flower embellishments on this lightweight crocheted baby cardigan will make your little petunia look right in fashion this spring. Thankfully those “fancy” flowers are quite easy to make in just a few rows. What a delightful way to welcome warmer weather and the return of those beautiful blooms. The Mari Nursing Wrap by Robyn Chachula allows mom to nurse in elegant privacy. A granny-square border frames a curtain of linked stitches, which provides excellent coverage, and the cotton/linen-blend yarn becomes softer each time it is laundered. For convenience, the wrap can be hooked over Mom’s neck with the attached strap for feeding or draped over a stroller to shield sleeping baby from the elements. The Berry Baby Hat and Booties by Chloe Nightingale make great quick-crochet gifts. The hat is worked in single crochet and sized from preemie to adult, for grown-ups who enjoy embracing their inner whimsy. The booties are worked from the toe-up, and the heel is shaped with deceptive ease, making these crocheted booties perfect for first-time footwear makers. The Summer Blues Baby Dress by Ellen K. Gormley is an adorable girlie dress without being fussy. Stitches of differing height provide comfortable stretch through the skirt, and minimal seaming makes this quick to crochet. 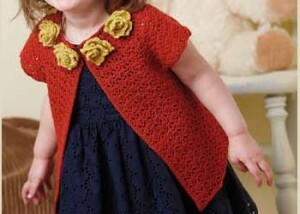 This project will be a favorite both for the crocheter and the wearer. Baby Bear’s Backup Hat by Marty Miller works up quickly and easily in double crochet stitches. Roll up the brim and add the optional pom-pom for added character. This simple hat works up quickly and easily using double crochet stitches. Add your own personality or fun character to the crochet baby hat pattern by using a variety of colors.You can whip up this simple crocheted stocking cap in an evening, making it the perfect last-minute gift. Goldilocks’s Hat by Marty Miller embellishes an easy single-crochet hat with a delicate flower and fun ruffle. This quick crocheted cap is as adorable as it is warm. 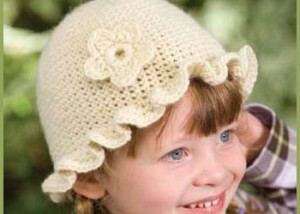 You can find the rest of the Goldilocks’s family of hats in the Interweave Crochet Accessories 2010 issue. Whether you have upcoming baby showers or expecting yourself, you’re sure to love every one of these designs. We’ve included all the baby must-haves in this free collection including two baby blanket crochet patterns to choose from. 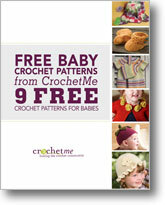 Whether you create one or all nine of the crochet baby patterns in this free collection, you are sure to find joy in each precious pattern you work up. Claim your Free Baby Crochet Patterns: 9 Free Crochet Patterns for Babies eBook, for a collection of crochet baby patterns to get started on today!